A compact crossover like the 2018 Toyota RAV4 gives you SUV capability in a package for urban spaces. New features for the year include a leather-wrapped shift knob, all-weather floor mats, and unique interior trim panels. The Toyota RAV4 also features an Adventure trim level that includes a Tow Prep package to make it easy and convenient to pull a trailer. LE: To ensure a smoother ride, the front suspension consists of independent MacPherson struts while the rear uses a double-wishbone style multi-link version. Electric Power Steering makes maneuvering easier. 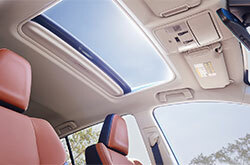 XLE: Expand your view of the sky by opening the power tilt/slide moonroof that comes with a sunshade in case the sun gets too hot. Dual-zone automatic climate control keeps the interior comfortable with separate levels for you and your front passenger. Adventure: You can explore rougher terrain with 18-inch alloy wheels and a taller ride height. Black adds edgy style to the headlight bezels fog light surrounds. A 120-volt power outlet in the cargo area charges up any equipment that you want to bring. SE: The projector-beam headlights last longer and shine brighter by consisting of high-tech LEDs. Keep your hands on the wheel when changing gears by flipping the paddle shifters that are conveniently mounted on the steering wheel. Limited: You can power-customize your driver seat in up to 8 ways and then store your definitions in memory for later recall. Entune Audio ups its information game with apps like OpenTable for restaurant reservations and Pandora for additional music choices. Platinum: Top of the line means top-down views with the virtual 360-degree views shown by the Bird's Eye View Camera. Keep your keys in your pocket when you unlock any of the doors if you have the Smart Key System fob on you. 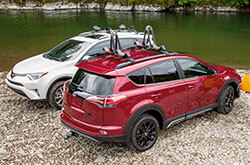 Both the following engines can come with almost any of the 2018 Toyota RAV4 trims except for the Adventure and Platinum, which only include the conventional option. Conventional: You'll get an EPA-estimated 23 city MPG and 30 highway MPG with the 2.5-liter 4-cylinder, which can tow up to 1,500 lbs. Helping to deliver these specs are Dual Overhead Cams, Dual Variable Valve Timing with intelligence and the 6-speed Electronically Controlled automatic Transmission with intelligence. Hybrid: By pairing the gasoline engine with three electric motors, the hybrid option gives you an EPA-estimated 34 city MPG and 30 highway MPG with help from the Continuously Variable Transmission. Learn how to squeeze out every mile and all 194 horsepower with data from the energy motor and the special gauge cluster. Toyota Safety Sense™ is a suite of active driver-assist features that include Automatic High Beams, Pre-Collision with Pedestrian Detection, and Lane Departure Alert with Steering Assist. Star Safety System consists of passive technology to protect you from unsafe situations. They cover the Anti-lock Brake System, Electronic Brake-force Distribution, Brake Assist, Smart Stop Technology, Vehicle Stability Control and Traction Control. Additional safety pluses include the Rear Cross-Traffic Alert that warns you about vehicles crossing your path as you reverse, Blind Spot Monitor for telling you when cars enter your blind zone and eight bags that inflate in case of an accident. The 2018 Toyota RAV4 features many advantages for your road trips. Experience them in person by making your way to Toyota of Richardson and asking a sales consultant for a test drive.